September 2015 sees the release of Doug Hyde’s ‘Friends Reunited’ sculpture collection. Washington Green’s – Spring 2015 – Fine Art Collector magazine, released in March 2015 and showcasing their latest limited edition releases. 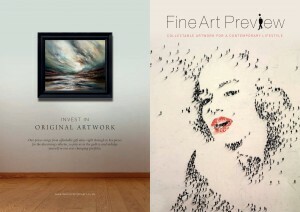 Demontfort Fine Art’s – Spring 2015 – Fine Art Preview magazine, released in March 2015 and showcasing their latest limited edition releases. Doug Hyde’s publisher, Demontfort Fine Art, have been circulating teaser imagery for their range of New Releases which will include a Doug Hyde collection. Set to be unveiled to gallery owners from Sunday 1st September 2013, when Demontfort Fine Art host their trade only launch day (which coincides with the NEC Autumn Fair) we expect these images to then be revealed to the public within days. A blurred out snapshot artwork, Magnifying glass digitally inserted! 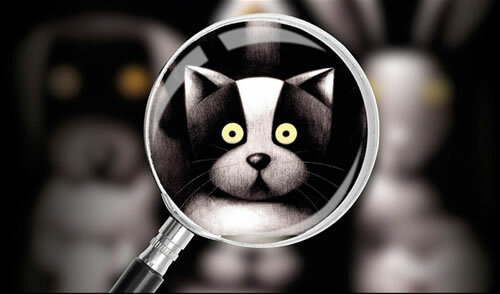 The so far singly revealed artwork (see above), has been blurred out except for the digitally inserted magnifying glass and we can see that this appears to be a very different Doug Hyde image. We believe this collection will be called ‘Rural Retreat’ and this is either the 15th or 16th collection to date by Doug (will confirm in a future post!) â€“ a remarkable achievement in its own right. I also believe it will depict amongst other things: dogs, cats, geese, hedgehogs & bunnies, as well as buckets & eggs! and the impetus for this is that Doug has himself has recently moved to a more rural location in the UK. I have also been told there is at least one sculpture amongst the limited editions releases.